A while back my mom gave me some “To-Do List” notebooks to help me organize my daily tasks, but I recently ran out. Considering I used them so often, I decided to create my own List Template. Download it here: To-Do List Download. My To-Do List is part of my daily routine- I wake up, brew a cup of coffee, and start a fresh “To-Do List” for the day. Whatever tasks I don’t complete that day will be at the top of my list for the next day. It’s also helpful to have a little section for things to pickup while I’m out. For instance, if we run out of laundry detergent, I’ll add it to the bottom and when I’m out…it reminds me to grab it. To avoid feeling overwhelmed with tasks, tackle things day-by-day…don’t make a huge lists of all of your tasks. Instead, give yourself 15 tasks a day and gradually complete everything that needs doing. If you add too many things on your list, you are setting yourself for added stress- the mere sight of un-done tasks can cause major anxiety (for some). HAHA absolutely…the coffee is essential 😉 Who can function without it? 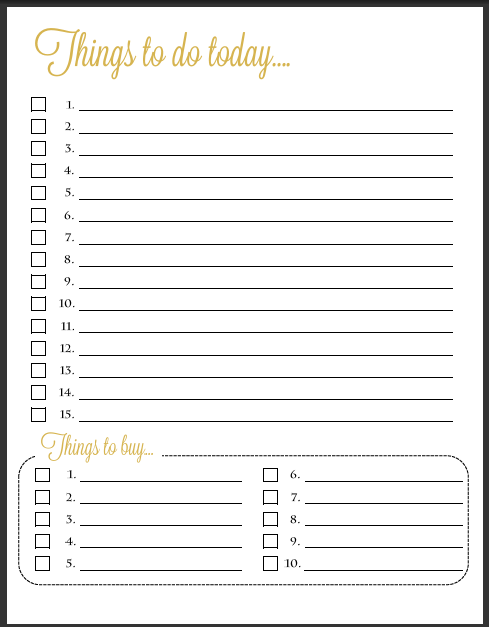 I love the list, and I’m adapting it to use for my office & home! Odd question…what font did you use for the header? I love it!!!! I’m so glad you like it. The font is called Lavandaria. It’s one of my favorites. Its Lavanderia font. Free to download…lots of others just like it.